Running Amok – Sometimes about running. Sometimes not. Sometimes about running. Sometimes not. May I have the “reset” button, please? So…that didn’t happen. It would be easy to shift blame and point out several incidents that slowed me down – or flat-out stopped me here and there. This has not been an easy year, in terms of professional commitments and stress, and I also had major chunks of personal time I allowed to take me away from the discipline required to come back and compete. Throughout it all, I have lacked the drive or the motivation. Basically, there is really only one constant in all of it. The guy looking back at me in the mirror! I got a reconstructed ulnar collateral ligament for Christmas! I don’t do New Year’s resolutions because being resolute should be a constant thing. Instead, I look to 2019 as my opportunity to change the narrative of the last 18 months by getting back to the basics. Finding my groove. And just enjoying life more. A lot of that will be working to find my resolve again, but also trying to break through some of the clutter that is so easy to trip over or become too focused on. If that all works out, then perhaps Rock ‘N’ Roll Arizona Marathon in 2020 becomes reality. And why not? That would be the 10th anniversary of my first marathon and the beginning of a transformative period of my life. I wouldn’t mind doing that again. Over the last 9 months, I pulled a hamstring twice and battled an Achilles tendon possessed with angry demons. Every time I tried to get going, I was quickly reminded that I was either trying to do too much too fast or wasn’t ready to be going anywhere. I also found out (imagine this…) that craft beer and whiskey donotcure Achilles tendons and might actually cause other problems. Whaaaaaaaaaat??? I was in a funk – and it was affecting many other aspects of my life, too. However, the last couple of weeks have seen the clouds lift a bit. Within the past few days, I have had the best runs I’ve had all year. Even though they weren’t all that long or all that fast, I felt good the whole way. I felt like I could go farther. I actually wanted to go farther. Nothing hurt during either run, and nothing hurts now. Eureka! On Memorial Day, I will run in the 40thBolder Boulder. Even before I knew I was going to be better by now, I still registered. I figured I could crawl, if I had to, because it was important to me to run it. Way back on Memorial Day in 2008, my very first race in Colorado (and my second ever) was the 30thBolder Boulder so Monday is a sort of anniversary, of sorts. Since that time, I made it through 11 marathons and any other number of races so getting back to where it all started seems important. I don’t care how I do. I’m not going to go very fast, but I’ll be there. Plus, there is beer at the finish, so I know I’ll be there. Earlier today, I was talking with my chiropractor about my knowledge that I do better when I remember that “food is fuel.” Unlike a car, you can overfill your body’s tank – and when that happens the body does terrible things to itself to store that extra energy. As June begins, my plan is to continue to regain my running form but also do more to take care of myself. Unfortunately, I have met the enemy and the enemy is me. I will stretch and strengthen more, and I will take better care of what goes into me. By the end of the year, I would like to have a half marathon back under my belt (maybe two) and be in good enough shape to go back where I started – Rock ‘N’ Roll Arizona, January 20, 2019. What might have been wasn’t. What could be still may be. After being chewed up and spit out at by the Boston Marathon last April – and loving every minute of it because c’mon…it’s still Boston! – I devised a plan. But – it didn’t really work out. Afterwards, the plan was to work through 2017 to get back in the right shape and go back to where it all started. If that plan had been executed, I would be limping around today in Phoenix after running the Phoenix Rock ‘N’ Roll Marathon. Let’s just say the plan never became reality. Between choices that did not support the goal, coupled with two different injuries, a return to a marathon on January 14, 2018 was not to be. Now what, indeed? Nothing has changed. I still want to run marathons. I love the challenge and the conquest. However, I think I am smart enough to know that I have to walk before I can run – so to speak. I slowed down…I got soft. I gained weight and lost fitness. There is so much I need to get back before I can even contemplate running a race (let alone a marathon). I certainly am lucky to have people who will both support me and help me. However, the only road back is one I alone have to run. New Year’s resolutions, to me, are trivial. Either commitment exists or it doesn’t. So it is only coincidental that the road back begins in January. The road to…happiness, health, fitness, and consistency. Hopefully, the work/life balance will not get in the way. I chip away. I start small. Eat right. Drink less. Make good choices. Stretch!! I remember how dedicated I was when I ran my first few marathons – and even before that when I just wanted to be healthy. It is not something that is handed to you. That would be too easy. It is something that is worked for and earned. That is the path I am on. Whatever could be, still may be. First things first. A lot of people are reacting to the news of Sen. John McCain’s brain tumor as if he just died. Big mistake. I would not put it past the man to “beat the rap” and live another 20 years. So this story is not to be taken as an obituary. It just happens to be one of my favorite memories of a great man who is in the news lately. In 1994, I was in my second semester of graduate school and got a job offer I couldn’t refuse. I was hired to be the office manager for the Casper, Wyoming campaign headquarters of “Craig Thomas for Senate.” Congressman Thomas was running for the U.S. Senate seat being vacated by the venerable Sen. Malcolm Wallop and was going up against a good friend and popular Democratic governor – Gov. Mike Sullivan. I made arrangements to continue my spring semester classes and began working for the campaign in late February 1994. I was a college student that was lucky enough to have my own car – a 1984 Buick Century Limited that was in perfect condition. I loved that car. Unfortunately, a few months after setting up shop in Casper, a woman driving a compact car blew a red light near downtown resulting in me T-boning her and totaling both our cars. I ended up getting a bit more money out of it than I expected, and one of my friends working on the campaign told me about a car that a friend was selling. It was a 1991 Lincoln Continental Signature. White, burgundy leather, sunroof, JBL sound system…pimp-mobile. Of course, I bought it. It was ridiculous. This is not my car, but it’s pretty close to what it looked like. Fast forward a month or so. The campaign was in full swing. Both the Republican and Democratic National Committees were putting a lot of money into Wyoming because it was deemed a potential Dem pickup. Gov. (later Ambassador) Sullivan is a good and honorable man, and he was a popular governor in conservative Wyoming. Craig was also popular and had made his mark as a Congressman in his first few years. That kind of contest meant bringing in the big guns. For the Republicans in mid-1994, that meant a fundraiser in Casper with Charlton Heston and U.S. Senator John McCain. As luck would have it, I was asked to go pick up Senator McCain at the Casper airport. I was lucky enough to have met him when I interned for one of Wyoming’s favorite son’s, U.S. Senator Alan Simpson, although I had no expectation in the world that Sen. McCain would remember that. I made sure I was early and pulled up outside the terminal in my amazing new (to me) Lincoln Continental. Out he came, and I secured him quickly and got him into the car. Without hesitation, he tossed his stuff in the backseat and sat down in the front. A man of the people. We had about 10-15 minutes of travel time between the airport and the event location, and true to form, Sen. McCain was interested to know who I was and how I came to work on the campaign. As I gave him my brief biography, talked about my time as an intern with Sen. Simpson, and recounted the time I had met him outside the Senate chambers, I could not help but notice that Sen. McCain was distracted. He looked around the front of the car, turned to look around the back seat, up and out of the sunroof, and then turned to me. “Is this your car?” he asked, incredulously. I only had about two minutes to explain the whole tale. To this day, I have the memory of his half smile, snickering slightly under his breath as he got out of the car and grabbed his stuff. If you have seen him do it, then you know exactly what it looks and sounds like. Sen. John McCain got to ride in my pimp-mobile – and we had a pretty good laugh about it. That’s my John McCain moment, and it is one of my favorite memories. For me, there is more to life than running. If you followed the blog that I wrote pretty religiously for the years I found religion on running – A Funny Thing Happened On the Way to the Marathon – then you know it was exclusively a running blog. As it turns out, I spend a lot more time doing other things…and a lot of time thinking about other things. That was not the case for the first few years of the blog, when I was (yes, I can admit it) obsessed. But there is more to life than running, starting with my lovely bride and stepdaughter. Family is everything. So when I can, I’ll post something here. Sometimes it will be about family. Sometimes about running. Maybe work or traveling. Maybe (with apologies to “Seinfeld” it will be about nothing at all). It will be more interesting to write than “A Funny Thing…” because a spend most of my time doing something other than running – or thinking about running – and write I about should conceivably be more diverse. So here we go…running amok in the world. After several weeks of basically maintenace miles, coupled with bouts of self-destruction sporadic rehabiliation, the march to the Boston Marathon on April 17, 2017 has begun. 164 days. That’s just over 5 months. That is an eternity for a training plan. And while I don’t yet have a formal training plan (that comes in a few more weeks), I have plan on how to get to Hopkinton in shape and ready to go. The first thing I committed to do is a tune up race, which will be the Phoenix Half Marathon on February 25. Two years ago, I had the exact same plan before Boston 2014, and I ended up getting quite sick after an early February half marathon here in Colorado. I arrived in Phoenix three weeks later having not run at all since the previous half. I slogged my way 13.1 miles in a respectable time, but it in no way was the race I could have run there. A lot people do not like winter training, especially in Colorado. Come on…cold, snow – maybe a little ice? What’s not to love?? Other than dealing with the demands of my work life and the shorter days, I actually love winter training. As long as the temperature is not below zero, for example, I find that I have trained better in the winter than I have in the summer, primarily because I do not ever really get cold. By comparison, I overheat easily, especially when the temperature is over 60º. I attribute this to growing up in Jackson Hole, Wyoming, where -30º temps for part of the winter were not unheard of. We skied in it all the time, and I remember how good it felt when it eventually “warmed up” and got above zero. My ideal running conditions would be 45º with overcast skies and no wind. Maybe not for EVERY run, and I will be prepared to run in anything. The upside is that the whole world looks different in the wintertime. Questions for you: Do you like winter training? How do you handle running in cold weather? What is the coldest weather you’ve ever run in? As it turns out, much to my chagrin, most people can’t just run without doing OTHER things to create balance. Balance in the development of muscles. Balance in amount of time spent being active. Balance between amount of beer and number of miles. 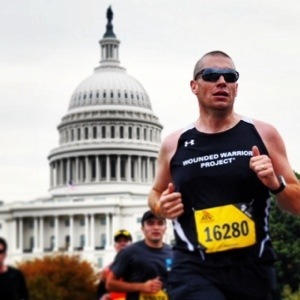 Ever since the Marine Corps Marathon in the fall of 2013, I’ve felt like I have been battling my body for control over my life. No doubt about it…I went for it that day and got my PR, and I managed to damage myself in the process. Even though I’ve run three marathons, since that time, I don’t think I have ever fully recovered – or, perhaps more importantly, I’ve never allowed myself the chance to strengthen my body to allow the recovery to occur. Consequently, my miles have declined over time and each mile seems like more of a struggle than the last one. Beyond being frustrating, it also has the brutally ironic twist of allowing me to put on some pounds – which, of course, exacerbates everything. It is a downward spiral – admittedly self-inflicted – that I have not done much of anything about. To put it bluntly, if all you do is run, then all you work are running muscles. Everyone knows you are supposed to cross-train, but not everyone does it and some people are lucky enough to get away with it. In my case, my IT bands are like piano wire, trying to stretch my quads is like trying to pull cold taffy, my low back is in nearly constant discomfort, my backside isn’t much better, and I am back over a weight threshold I swore I would never cross when I lost all my chub the first time. However, nothing is torn. Nothing is broken. Nothing is irreparable. While I have been going to chiropractor for a number of years, I knew that he has more recently only been treating the symptoms. I knew it was up to me to treat the problem, but, I had previously been unsure of exactly how I wanted to go about it. The answer was in front of me – a member of my running group. Now that my work schedule allows me a little bit more time to have a life, I am doing something about it. A couple of weeks ago, I made my first visit to Accelerate Health, which is conveniently located a few blocks from my office. After a few different screens and test to determine where my main issues were, she delivered the news with a smile. “Well, it’s not the worst I’ve ever seen.” That is all I needed to hear. I’ve now had acupuncture and active release techniques performed on two of my trouble spots in two appointments. While those will continue, the bulk of the work is up to me. My doc handed me several exercises to do to build up the muscles that are underperforming and allowing other muscles to become overdeveloped and pull my frame out of balance. Much like your car, if the frame out of alignment, then things wear out faster, wobble a lot, and eventually break. This is long overdue. I guess I knew a while ago I needed to do more than I was doing, but hoping something gets better when nothing else is changing is never a recipe for success. The good news is that I do not have to stop running, and there is no pressure of an imminent race. In fact, with Boston in April 2017 next up for me, I’ve got some time to do it right. The priority is to be better about making more time to do the things I am supposed to do so that I can continue to get the same benefits and enjoyment out of running that have been lost to me for a while. I enjoy running…but I wasn’t enjoying it when it was a struggle just to do the easy runs. And if I can get pain, tightness, and discomfort to go away??? Well, then, jackpot. 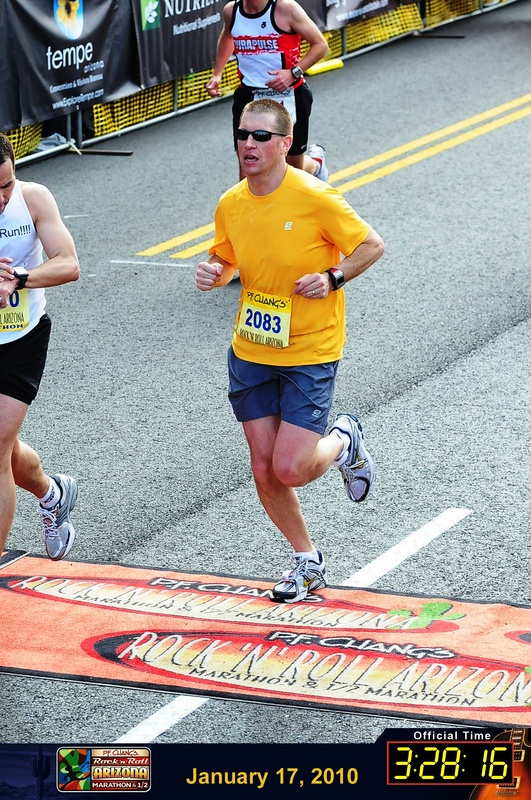 Thanks, Facebook, for reminding me that today is the anniversary of the first marathon I ever ran – the PF Chang’s Rock ‘N’ Roll Arizona – on January 17, 2010. My lovely bride still occasionally mentions those words that came out of my mouth sometime before I ran my first half marathon in Seattle in June 2009. It was the inaugural Seattle Rock ‘N’ Roll Marathon & Half, and I was intimidated at the thought of having to run a half marathon twice – until the moment I was running down the chute toward the finish line, catching glimpse of my bride yelling and cheering me on. It was intoxicating and exhilarating – a feeling that is difficult to describe to anyone that has not experienced it. I had not even finished, and I was already making plans for 26.2 miles. I have logged nearly 7000 miles between the time I started training for Arizona and today’s anniversary. Many marathoners I train with have run a lot more miles than that and trained a lot harder than I have at times. When I finished 26.2 miles in the desert, though, I knew I was going to do it. Like I said…hooked. Today, I am content to think back on that day and be pretty happy and proud of what that meant at that time in my life, especially after the fairly wild ride in the five years before that. 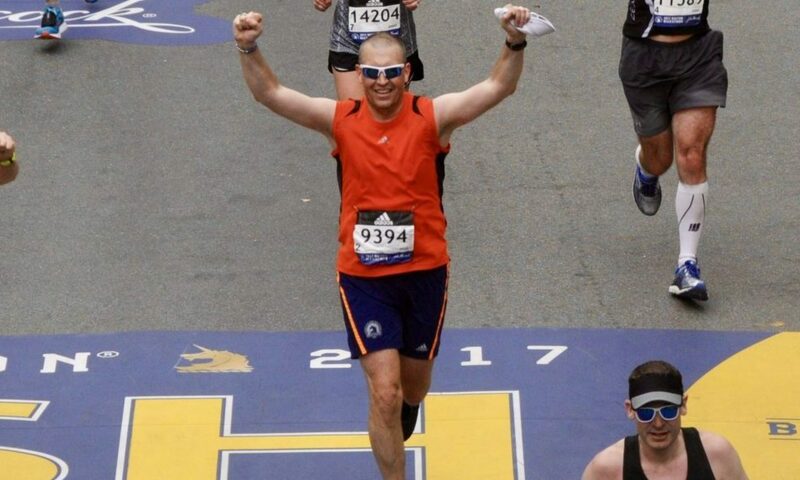 Tomorrow, I will let myself start thinking again about the rest of this year and April 17, 2017 – Patriots Day in Boston and the 121st Boston Marathon. Looking back at 2015, it would be easy to fall into a trap of thinking it wasn’t a very good running year. I had grand plans for tune-up races and summer marathon training before heading off to Minneapolis in October for the Twin Cities Marathon. After the holidays, I wanted to get back in the groove again in preparation for Twin Cities. I stepped up training and signed up for the Ralston Creek Half Marathon in early February and the Phoenix Half Marathon at the end of February. The Ralston Creek Half turned out to be a total grunt. The first 7 miles is uphill, for the most part, and that particular morning it was also into a 30-40 mph headwind! The downhill tailwind at the end was nice, but I didn’t get to enjoy it much after nearly being blown away getting to that point. My reward for that effort was getting a bad cold that knocked me down for a couple of weeks. In fact, I did not run a step between the Ralston Creek Marathon and three weeks later when I lined up in Mesa, Arizona at the start of the Phoenix Half Marathon. Needless to say, there was no PR that day, and I was damn happy just to finish! I did not race again until the Colfax Half Marathon in mid-May and the BolderBoulder on Memorial Day, both of which went fine. I still was not where I wanted to be. It was a good start to my summer, though, and served as a marker for where I needed to go from there. After whining about it a bit in a post back in June, I started summer training a week later and set my sights set on the Twin Cities. I set some training goals for myself back then, and I did a pretty good job of sticking to them. I never wrote about my training after June 1, though, because I often did not have a lot of good things to say. I had a couple early summer runs of 20 miles or more, but I felt like I was slipping back into the same pattern of the previous summer of feeling wilted for a week or so afterwards. And unlike previous years, my weight did not drop as it usually does as my mileage increased, which was a bit of a head scratcher. As the summer progressed, I never really felt like I was in a solid training groove and often battled my way through training runs. It started messing with my enthusiasm and left me, a few times, contemplating just backing off and doing Twin Cities as a fun run. I was fairly content to get my miles in and do the best I could because I thought my BQ minus 2:27 from Wineglass was going to easily get me into Boston 2016. …and then a few days before the Twin Cities Marathon, I found out I missed Boston by 1 second. At the time, I wrote: “I honestly have no idea how my run will go. I am not 100% and had a so-so training cycle.” What I didn’t write down was that I was both ticked off and at peace at the same time, if that makes any sense. It made sense to me, I guess, and I managed to run my best marathon in Minneapolis-St. Paul that day. A BQ minus 9:50 means Boston 2017 is on. So in spite of all the setbacks and struggles, it all worked out and was a good reminder that good things can happen at any point. I end 2015 having spent 3 weeks out of my running shoes after getting yet another nasty cold right after Thanksgiving. As I close out a pretty interesting year, I am just starting to get back on my feet and trying like heck to get my wind back. Right now, I don’t plan to run another marathon until Boston 2017. That could change, of course, but right now I feel like I am better served addressing the tweaks, strains, wilts, and wobbles that seem to come up more often when I am running higher mileage. Getting back to the basics of fitness and nutrition, while focusing on shorter distances and getting faster will serve me better overall. I still think about the elusive sub-3:10:00 marathon from time to time. I was close in 2013. In order to pull that off, I think I would have to drop a lot of weight and basically strip down to a flying gas can. (With apologies to “The Hunt for Red October”) Whether or not I can and whether or not I want to are a couple of questions I’ll have to answer then. Happy, Prosperous, and Speedy New Year! When Do You Stop Calling it a PR? Two years ago this weekend, I ran my fastest marathon. I trained hard, fueled well, caught a day with near perfect conditions in Washington, and ran my PR of 3:11:38. When I finished that day, I had nothing left. I stumbled around the finish area trying to get my senses about me and refuel. I was finally able to hobble out of the secure area where (thankfully) my dad was able to find me and hang with me as I continued to try to recover my wits. After sitting in the sun for about 20 minutes and getting some more recovery food and drink in my body, I was finally able to get up and move…straight to the beer tent! I have said before that I believe that marathon injured me in ways that have affected me in the last couple of years. While I wanted to try to break under 3:10:00, I was never able to put together a training cycle without fatigue and malaise, mostly in my upper legs. After last fall’s debacle and near DNF at the Wineglass Marathon, it began occur to me that I may never run faster than I did in 2013. If that is the case, I am actually fine with it. It has been a two-year ordeal trying to figure out exactly what is wrong with me and how to fix it, but a lot of the frustration I had been having went away earlier this month with a much better than expected result in the Twin Cities Marathon – a BQ by 9:50. The result was less important than it being the strongest, most consistent race I’ve run. Twin Cities Marathon, 10/5/15. 3:15:10. So the real question is, then — how much time has to pass by before a PR is no longer a PR? In 10 years from now – assuming I never run a faster marathon – it would be absurd to still be saying 3:11:38 is my PR. What is the etiquette? Do I qualify it? “Well, I ran a 3:11, but that was in 2013.” This is uncharted territory so for now, I’ve just been saying that and that I recently ran a 3:15. That will likely have to do because I don’t know that I’ll be running any marathons again anytime soon. I have all but guaranteed myself a slot in Boston in April 2017 – and that may very well be my next one. I could use a break, but I also want to travel with my lovely bride next fall and let her know that it does not have to revolve around a marathon!